The hearing, which included discussion of the MTA plan to restore New York City’s ailing subway system, occurred amid an ongoing feud between New York City Mayor Bill de Blasio and Governor Andrew Cuomo over the funding of crucial repairs for the deteriorating transit system, which is controlled by the state. In a four-hour session that was at times good-natured and at others tense, members of the Senate and Assembly repeatedly questioned Lhota on three controversial and relevant aspects of Cuomo’s 2018 agenda: cost shifts of capital funding for the city’s subway system from the state to the city as outlined in Cuomo’s budget; a “value capture” plan to allow the state to reap property tax revenue spurred by transportation improvements in the city; and the recently unveiled congestion pricing plan outlined by Cuomo’s “Fix NYC” panel. These issues were addressed by de Blasio officials in a press conference call with reporters two days earlier. “We are objecting strongly to language that was inserted into the budget that would create a new, capital liability, a new capital commitment liability on the part of the city for New York City Transit, which is breaking a long-standing history of how the MTA is funded,” said First Deputy Mayor Dean Fuleihan during the call. He and the other officials on the call also pushed back against the value capture proposal, calling it an unprecedented intrusion into the city’s tax system. Mayor de Blasio himself also expressed his opposition during his weekly appearance on WNYC radio’s The Brian Lehrer Show, saying Friday morning. De Blasio will testify himself at a state legislative budget hearing in Albany on Monday, February 5. MTA funding, including the state’s insistence that the city pay about $450 million toward Lhota’s emergency subway stabilization plan, will likely be topics of discussion. During his testimony Thursday, Lhota said the state’s $836 million Subway Action Plan launched last summer to restabilize the city's subway service is working, citing the MTA’s ability to prevent the predicted “summer of hell” in 2017, though the data does not necessarily support his claim, as explained by Nicole Gelinas of The New York Post. “That’s not true — or only true if you compare summer and autumn to winter and spring, instead of a season to the previous year’s season. The latter is a far better measure because of similar crowding and weather,” Gelinas writes. Despite this, Lhota said he attributes the MTA’s success at preempting a disastrous transportation summer to heightened “vigilance” on the part of the agency, something he said must continue year-round. He also announced technological improvements coming to the MTA, such as a new signaling technology, a fleet of electric buses, and the Freedom Ticket, which allows Long Island Rail Road commuters to seamlessly transfer to the subway system. "I fully expect it to happen this year," Lhota said of the Freedom Ticket. Cuomo's executive budget allocates $9.7 billion for the departments of transportation and motor vehicles, the Thruway Authority, and the MTA. However, the budget shifts all of the responsibility for capital costs to the City of New York, which would “require a sevenfold increase in City capital contributions,” according to Citizens Budget Commission President Carol Kellermann. Lhota said this type of fluctuation is typical of past capital plans for transportation. 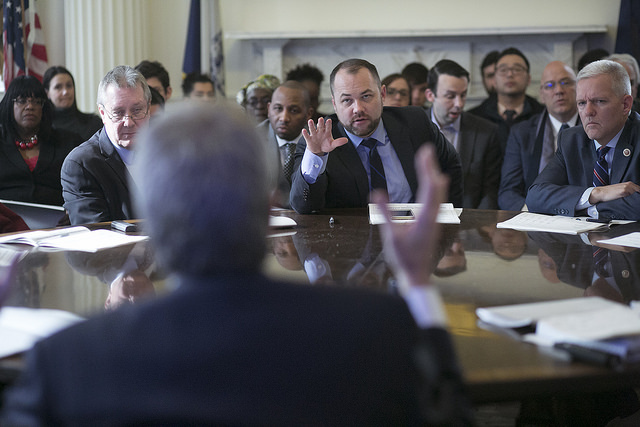 Mayor de Blasio is expected to continue to push back on the proposal in the coming weeks, while also relying on state legislators from the five boroughs to take up the cause in budget negotiations with the governor’s administration. De Blasio has reluctantly agreed to consider the congestion pricing plan released by Cuomo’s advisory panel. The plan, which is similar to one previously proposed by former New York City Mayor Michael Bloomberg and Cuomo has indicated he will tweak as he also negotiates with the Legislature, outlines a three-year, three-phase program aimed at reducing congestion in Manhattan and raising funds for transit improvements, especially the subway system. It also includes calls for the city to increase enforcement of certain traffic measures, like double-parking and placard abuse, that currently contribute to congestion. Fully phased in, the Fix NYC proposal would charge cars entering the most congested areas of Manhattan $11.52, while trucks would pay $25.34, and those riding in cabs or for-hire vehicles like Uber would see a $2 to $5 surcharge. The congestion fees would vary based on location and time of day, and would likely apply to non-commercial vehicles driving below 60th Street in Manhattan. The plan calls for new transit investments early on and estimates about $1.5 billion in annual revenue when fully implemented. De Blasio has previously called general congestion pricing, with new tolls on the East River bridges, a "regressive tax" that would disproportionately impact low- and middle-income commuters from outer boroughs, though there have been holes punched in that argument given the low percentage of people who commute into Manhattan from Queens and Brooklyn that are low-income. The mayor appeared less dismissive of the Fix NYC recommendations, calling them an improvement from prior congestion pricing plans. At Thursday’s hearing, lawmakers were divided on the congestion pricing recommendations, which will be parsed through the legislative process in the coming weeks. Senator Diane Savino, who sponsored the Move New York version of congestion pricing, approves of congestion pricing as a way to make the city’s transportation system more equitable for commuters from the outer boroughs. However, Savino, a member of the Independent Democratic Conference representing parts of Staten Island and bits of Brooklyn, questioned whether appointees to the Fix NYC board considered the Move New York plan as a “better proposal” to eliminate “winner and losers” while enabling the city to generate transportation revenue without going through Albany. A key element of Move New York not included in the Fix NYC recommendations is lowering tolls on the Verrazano and other currently-tolled bridges, something Cuomo indicated he wants to consider. 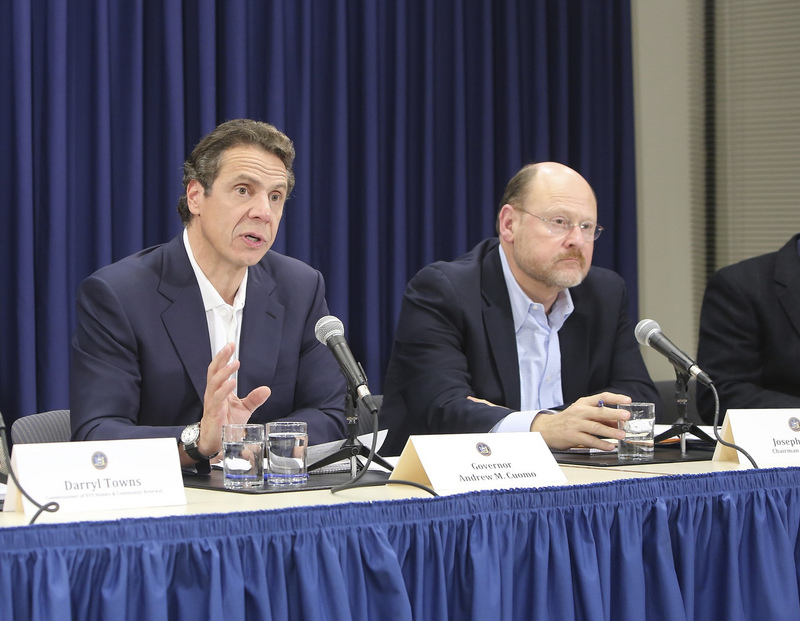 Lhota said that panel produced a plan that they believe is a good starting point and that such concerns have yet be addressed during the legislative process. “The basic concept is there. Now, how do we make it fair?” he said. Alex Matthiessen, the founder and director of Move New York, a group that evolved out of former Mayor Bloomberg’s failed attempt to pass a version of congestion pricing, has also thrown his support behind the Fix NYC plan despite its differences with his group’s proposal. “I thought that we had created the gold standard of congestion pricing plans, especially for the City of New York, tailored for the City of New York, and these guys actually improved upon our plan in a number of ways,” Matthiessen told Gotham Gazette and City Limits during a recent podcast. Other lawmakers and transportation experts are not yet sold on congestion pricing. Senator Leroy Comrie, a Queens Democrat, expressed skepticism of the plan, saying it does not solve the problem of congestion in Manhattan nor does it generate a reliable source of revenue for the MTA. Regarding Cuomo’s value capture plan, the mayor’s office maintains that the administration was not consulted ahead of time, and just learned of it from Cuomo’s executive budget. The budget proposal, which targets zones around transportation projects such as the makeover of Penn Station, the 125th Street Metro-North Railroad stop, and expansion of the Second Avenue Subway, would deprive the city of control over its own potential revenue, de Blasio officials say. “The City has significant obligations that we need to keep, that we need to make sure we are able to commit to—safest big city in America, universal pre-K for four-year-olds, expansion of pre-K, we can go on, addressing the opioid crisis,” said Fuleihan. At the hearing, Lhota fended off criticisms of Cuomo’s plan from New York City lawmakers, including Senator Liz Krueger, a Manhattan Democrat. “I can't emphasize enough why I think that this is a terrible idea, and I was hoping you would agree with me,” Krueger said of the value capture proposal. When asked by reporters why the city was not consulted in the drafting of the legislation, Lhota said he could not speak for the governor’s office. “You are asking me questions that should be directed at the [executive] chamber,” he said, but noted that Bloomberg used value capture to extend the 7 train to the Upper West Side of Manhattan (something de Blasio officials acknowledged but pointed out was a city decision). A spokesperson for Cuomo’s office addressed the criticisms saying that other major cities have used this strategy and they expected all affected to be on board with the plan. Lhota indicated that the value capture tax could be extended indefinitely after the investment is recouped, arguing that there was a good case for the tax to be continued to maintain the quality of the subway service. “There’s unanimity in the entire MTA board that if we are using taxpayer dollars, we should try to recoup some of that wherever we can,” he said. He also said that the state is constitutionally authorized to utilize the value capture plan in other parts of the city, as needed. 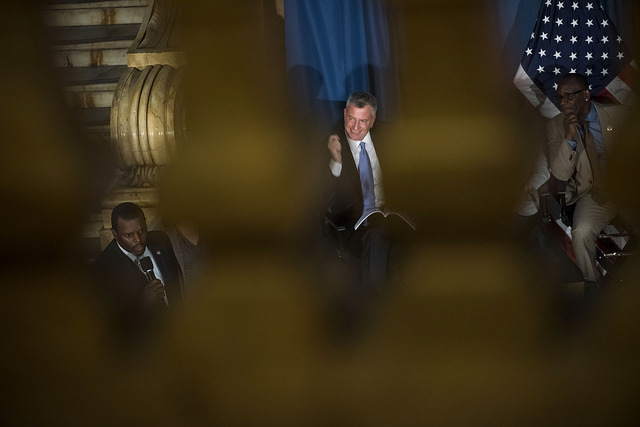 There were few surprises across the five boroughs, and voter behavior was largely consistent with the 2013 mayoral election, in which de Blasio beat Republican Joe Lhota, 73 percent to 24 percent. But in certain enclaves of the city, de Blasio’s main challenger, Republican Assemblymember Nicole Malliotakis, built on Lhota’s vote share and cut into the mayor’s margin of victory. The neighborhood by neighborhood break down of the vote not only tracks similarly to 2013, it also shows racial and ethnic divisions that have been consistent throughout de Blasio’s term. Meanwhile, Malliotakis’ performance was buoyed by her home borough of Staten Island. De Blasio received 66.16 percent of the vote, with Malliotakis pulling 27.67 percent, according to unofficial election night returns from the Board of Elections (absentee and affidavit ballots are still being counted). In absolute numbers, more New Yorkers voted on Tuesday -- 1.09 million -- than in 2013, when 1.08 million people cast ballots, which was 26 percent of registered voters at the time. A glance at the CUNY mapping service electoral maps from 2013 and 2017 show that de Blasio did not manage to either keep or expand on his vote share in several parts of the city. Some neighborhoods in Staten Island that voted for him in 2013 went deep red on Tuesday to back his Republican challenger. Similarly, parts of southern Brooklyn flipped to Republican, as did a section of northeastern Queens. Locales that were already Republican went further that way to varying degrees. As expected, Malliotakis’ strongest performance was on Staten Island, her home borough that she represents in the Assembly along with a sliver of Brooklyn. She won both the 50th and 51st Council districts, which cover the central and southern parts of the island. In the 49th Council district, represented by Debi Rose, a Democrat, de Blasio pulled votes along the northern shore. In total, Malliotakis received more than 67,000 votes on the island, while de Blasio got just over 24,000. In southern Brooklyn, Malliotakis won more neighborhoods across four Council districts than Lhota did in 2013. “She did better there but voter turnout wasn’t that high,” Romalewski pointed out. Bay Ridge, Dyker Heights, Bensonhurst, Gravesend, Sheepshead Bay and Midwood all went for Malliotakis. Notably, although Malliotakis carried most of the areas covering City Council District 43, the competitive open seat in that district went to a Democrat, Justin Brannan. Brannan, a progressive who had worked under de Blasio at the Department of Education, distanced himself from the mayor publicly, though aides to de Blasio helped Brannan on the ground. Other smaller pockets that skewed Republican were Bergen Beach, Mill Basin and some neighborhoods adjacent to Marine Park. Malliotakis also received significant support in Council District 32 in Queens, represented by Eric Ulrich, a moderate who is one of the three Republicans currently in the City Council. Breezy Point, Rockaway Park, Howard Beach, and Lindenwood chose Malliotakis, while the northern part of the district, including Ozone Park, Woodhaven and Richmond Hill, voted for de Blasio. Ulrich won reelection convincingly against a Democratic opponent. District 30 in Queens saw the closest City Council race and is yet to be called in one candidate’s favor. Incumbent Democrat Elizabeth Crowley may be headed to a loss against challenger Robert Holden, a registered Democrat who lost the primary to Crowley but ran on multiple ballot lines, including Republican and Conservative, in the general. Holden has a 133 vote lead and Crowley has yet to concede the race as other ballots are counted and a potential recount looms. A similar dynamic played out on the mayoral level, with Malliotakis winning most of the district, which covers Glendale, Maspeth, Ridgewood, Woodhaven and Woodside. Wide swathes of northeastern Queens, including College Point, Whitestone, Bayside and Little Neck, voted for Malliotakis. The neighborhoods fall within Council Member Paul Vallone’s constituency, District 19. Yet Vallone, a moderate Democrat, was comfortably reelected. Malliotakis also made inroads in Schuylerville, south of Pelham Bay Park in the East Bronx, in outgoing Council Member James Vacca’s 13th Council District. “I think de Blasio did more than well enough in pretty much all the areas where people supported him in 2013,” Romalewski noted. The areas Malliotakis won are those with high percentages of white residents, though de Blasio did well in parts of Brooklyn and Manhattan home to many white, liberal voters. Throughout the 2013 race and the mayor’s first term he has polled significantly higher among people of color than white people. De Blasio did best on Tuesday in neighborhoods such as his home area of Park Slope, as well as in areas of central Brooklyn (Crown Heights, Clinton Hill, East Flatbush, and beyond), southeast Queens, the south and north Bronx, and upper Manhattan. These are the areas where his win was by the largest margins. “The one thing I was surprised about was turnout,” Romalewski said, about the increase in the number of voters, if not the rate of voting. “That’s encouraging. It’s too early to say if it’s a trend but compared to going the other way, it’s good.” On Wednesday, de Blasio declared a “mandate” from the voters and said that a slight increase in overall turnout was indicative of a backlash against President Donald Trump. Newly-minted MTA chief Joe Lhota held a press conference last week to announce a rescue plan for the city’s ailing subway system. The agenda includes signal fixes, maintenance work, new emergency response teams, and even rider communication shifts. Lhota’s blueprint comes with $800-plus million price tag, he said, which set off another round of feuding between Mayor de Blasio and Governor Cuomo about how much the city and the state will each pitch in. While there is a great deal of attention necessarily being paid to the state of the city’s subway system, absent from the new MTA plan was measures to improve bus service. Transit advocates, city and state elected officials have subsequently pointed to buses as an overlooked but essential factor in improving New York City’s transit system, to provide commuters more reliable options and to reach people who live outside subway zones. Indicative of the need for attention to buses is the fact that subway underperformance and drops in service reliability have not spawned an increased reliance on the city’s bus system. In fact, as the New York Times reported in February, bus ridership fell by approximately 1.6 percent on weekdays and 4 percent on weekends in 2016 from the year before, in keeping with a multi-year trend of falling bus usage. Following Lhota’s announcement of the new “NYC Subway Action Plan,” State Assemblymember Jeffrey Dinowitz, who chairs the Assembly committee with MTA oversight, commended Lhota for releasing an emergency subway plan, but also encouraged him to address buses in the near future. “While I recognize that our signals, tracks, cars, and user experience are all at the forefront of public concern and discourse, there are many New Yorkers who need improvements in other areas as well,” said the Dinowitz statement. “Accessibility concerns and bus service remain in need of attention also, and I encourage Chairman Lhota to address these issues soon,” he said. While Dinowitz’s committee has done little by way of MTA oversight in recent years, the Assembly member has put forth some of his own recommendations and took part in a two-day series of subway rides on Thursday and Friday to talk to riders directly. John Raskin, executive director of transit advocacy group Riders Alliance, who has written and spoken favorably of Lhota and his plan, also said he would like to see advancements on buses. The bus system, particularly bus lanes, as many transit experts point out, can be changed relatively quickly, and by the mayor, if need be. Still, the state-run MTA holds the majority of control over buses as a whole. There is growing consensus among experts and elected officials pointing to expanding both Select Bus Service (SBS), essentially express buses, and transit signal priority (TPS), which helps buses move more quickly through traffic light changes. SBS is one of the joint ventures set in motion over the past few years that has shown signs of success. Ths mode differs from traditional buses in that passengers board from all doors, speeding up the process at each stop, and the stops are less frequent on routes, making SBS something of an “express.” SBS also uses proof-of-payment, where instead of dipping a metrocard, riders buy tickets at bus stop kiosks prior to boarding (they are checked randomly). SBS has been deployed on 14 routes across the city; several potential routes to expand the service have been proposed as well. Prominent current examples of SBS are on 1st and 2nd Avenues in Manhattan; the newly-added crosstown 79th Street and 86th Street routes Uptown; the B41, B44 and B46 in Brooklyn; the S79, connecting Bay Ridge and Staten Island; the Q70 which goes to LaGuardia Airport; and several others. “Both the MTA and New York City DOT can speed up the installation of Select Bus Service, which has proven both popular and effective, making buses run faster and attracting more riders who had given up on the slow local service that came before it,” wrote Raskin. Mayor de Blasio, for his part, often refers to SBS as a model. 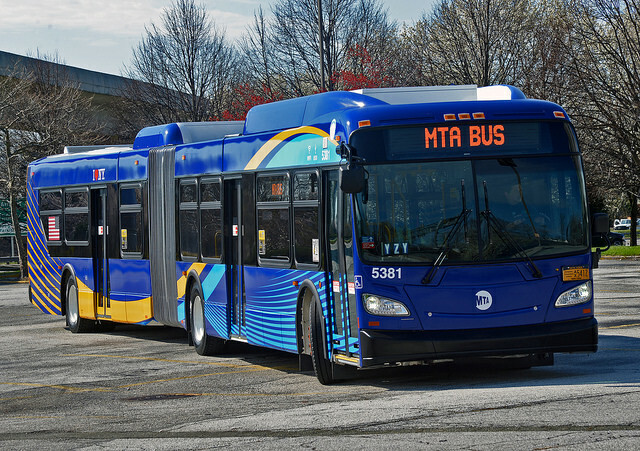 “That’s something we think has been a real success story -- so there are sometimes when things have been done the right way, and that’s one of them,” he said when asked about the buses by Gotham Gazette at a Thursday press conference. “Then we want to keep expanding. It’s a good news story,” he continued. “I’d put it in the same category as the other, newer types of transportation that are being developed rapidly: the ferry system, light rail, and obviously the expansion of Citi Bike -- all of these are going to be necessary to give people more options,” he said. Advocates and experts have also called for an expansion of bus service to places that are particularly distant from a subway stop and existing bus routes, such as certain parts of Brooklyn and Queens. With the impending closure of the L train in 2019, transit advocates have called for augmented bus service during the shutdown, which former MTA chief Tom Prendergast pledged to address last year. Last month, a coalition of eight transit advocacy groups gathered to announce a list of commitments they would like New York City lawmakers to champion and implement. Improving bus service was among the seven demands. “Unfortunately, service is often slow and unreliable, and buses are generally neglected by policymakers, at the expense of residents who already have the most punishing commutes,” the plan states. The coalition of advocates is urging the city to add additional bus lanes to local routes along with expanded Select Bus Services. But new bus routes are not the only way to improve service. Stricter, even dedicated bus lanes -- through physical barriers and NYPD enforcement -- are other options in the city’s toolbox. All-door boarding, an important component to SBS, is another endeavor for the city to consider putting into place across the system. Asked about attention to buses as the subway system has become more unreliable and MTA Chair Lhota said more temporary subway line shutdowns would be needed, an MTA spokesperson said, "We are also focused on our bus customers and several initiatives are already in place to improve bus service. As you know, the MTA is committed to maintaining and expanding Select Bus Service, which has been successful in reducing dwell times at bus stops. Every bus in our system can be tracked with GPS and customers can access this information on the MTA Bus Time app. The same data we use for the app we use to monitor bus schedule and service to help mitigate issues that may arise on the road in real time. Installation of a new fare payment system, which is being worked on, will also speed up boarding," said Kevin Ortiz, of the MTA. "Additionally, we continue to work with DOT to advance the rollout of Traffic Signal Prioritization city-wide and are looking at implementing all-door boarding where it is practical to do so," Ortiz added. "However, we don’t have direct control of road conditions on city streets. We are continuing to collaborate with DOT and NYPD to prioritize bus service as they address traffic congestion, unauthorized vehicles in bus lanes, double parked cars, and other factors that have the most direct impact on bus speeds and service reliability." Advocates have argued in favor of expanding transit signal priority (TSP) as a way to speed up existing bus routes. “Mayor de Blasio's administration could also make a difference, by accelerating the implementation of transit signal priority, where lights turn green faster when buses are waiting,” Raskin explained. Along these lines, TransitCenter, an organization of transportation experts, published a report on TSP. It notes that trips take longer than needed because “New Yorkers are stuck spending 21% of their bus rides stopped at red lights—but they shouldn’t be.” “Transit signal priority (TSP) can be used to extend green lights or shorten red ones when a bus is approaching, speeding up trips and improving schedule reliability,” it says. Given the fact that the city already uses TSP, and is effective along these routes -- the report cited city DOT data showing that TSP reduced travel time by 18% -- the proposal suggests that the city adopt a goal of utilizing TSP for 20 new routes by 2018. On the state level, in April, the Governor announced a new line of MTA buses that would be equipped with Wi-Fi and USB ports. Two thousand of these newly designed buses will be put to use in the next five years, according to the governor. Cuomo argued they will help reinvigorate the city’s bus system. “From opening the Second Avenue Subway, to bringing Wi-Fi and cell service to underground subway stations, we are reimagining the mass-transit experience for the metropolitan area,” Cuomo said in a press release. “These new state-of-the-art buses will better connect passengers who are on-the-go, create a stronger mass-transit system and bring New York into the 21st Century,” the statement continued. The high-tech bus model introduction and a late April press release regarding the addition of a bus “pilot program,” an introduction of 10 new environmentally friendly buses to the existing system, were the last times the state has given buses attention. The governor has mostly spent his MTA attention on subway-related matters, alternating between celebrating the Second Avenue Subway expansion, deflecting responsibility to the city, proposing additional gubernatorial powers to appoint MTA board members, telling the city to pay more money for the system, and taking renewed control of the situation. Note: this article was updated with comment from the MTA. Two separate subway track fires on Monday, in the morning and evening, that led to stoppages on multiple lines and delays across the system were just the latest incidents that put the spotlight on problems with New York City’s subways. The last few weeks have seen chronic delays, a recent A-train derailment, and passengers trapped on an F Train for nearly an hour without running air or power. Although issues with the subway system have long been apparent, and only increasing in severity, the official response has widely been deemed insufficient. Transit and infrastructure experts agree that the city and state must act now, and act together, to deal with the system’s overcrowding, aging trains and archaic signal mechanisms, and there seems to be broad consensus among them on policies and proposals that could solve the city’s transit crisis. Although the editorial drew a harsh rebuke from elected officials and New York’s tabloids, Emmanuel’s criticisms were not entirely off the mark. The MTA has largely failed to maintain and modernize the analog signal system in New York, which dates back to before World War II and is one of the key factors in system breakdowns. Although improvements are underway, at the rate the MTA is progressing, a system-wide upgrade is expected to take 50 years. Official accountability has also been lacking. Mayor Bill de Blasio has faced increased pressure from constituents, activists and political opponents to address the MTA’s poor performance, though he does not in fact control the state agency. The mayor has sought to distance himself from those issues, laying the problems at the feet of Governor Andrew Cuomo, who has authority and control over the MTA’s day-to-day operations. 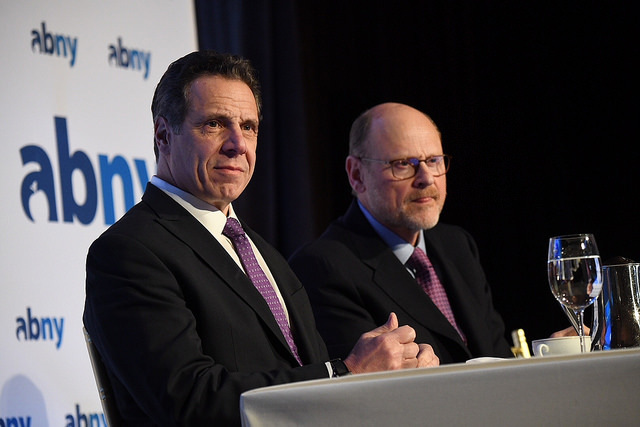 Cuomo, however, has argued that he has insufficient control of the agency despite appointing a plurality of the MTA’s board members and its chair. He recently proposed increasing the number of gubernatorial MTA appointees, declared a state of emergency for the MTA to ease procurement rules, and appointed Joe Lhota, who has previously served as MTA chair, to lead the agency yet again. Cuomo also pledged another $1 billion to the MTA capital plan. "If suspending procurement rules is a good idea, why is it only being done for $1 billion? Why isn't the governor pressing for more fundamental reform?” wondered Stephen Smith, an urban and transit policy expert who runs the popular Twitter account Market Urbanism. Smith, along with other transit experts, are skeptical that throwing more money at the problem will work unless officials implement multi-faceted solutions that address existing infrastructure, spending efficiency, management and capital project completion, to name a few. One of the main ailments affecting subway infrastructure is the old and neglected signal system, which the MTA has acknowledged is one of its most important challenges. The state has already allocated $2.1 billion, of the MTA’s total $29.5 billion capital plan, for signal improvements. “We’re undergoing a top-to-bottom review, but make no mistake, we must do maintenance and system expansion to underserved communities at the same time,” said MTA Chair Lhota in a statement earlier this month to the New York Daily News, responding to Emmanuel’s op-ed. 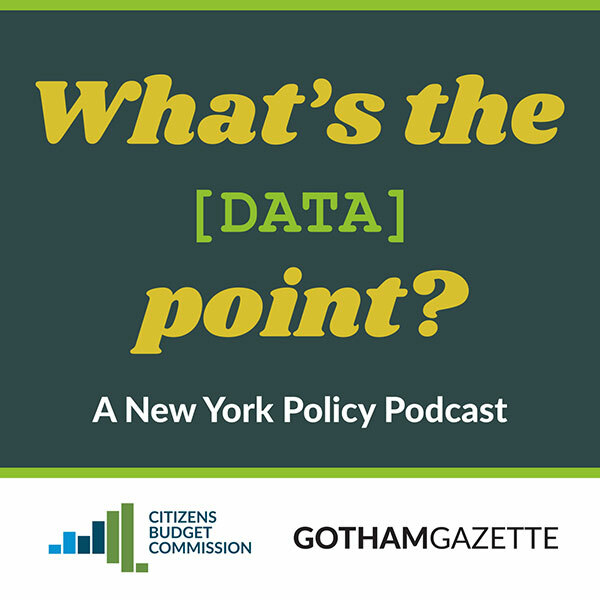 On a recent episode of What’s the [Data] Point?, a joint podcast hosted by Gotham Gazette and Citizens Budget Commission, Janno Lieber, the MTA's new chief development officer pointed towards expanding use of Communications-based train control (CBTC), a signal system that would allow trains to move in closer proximity to one another due to more precise tracking of trains. According to Lieber, CBTC improves service by allowing more cars to run on a particular lines while reducing the delays and danger that often come with crowded tracks. The upgrade is currently in use on on the 7 and L lines, with plans to implement them in the E, F, M and R lines as well. Kabak supports the MTA’s plan to effect repairs on the L Train, which will involve a complete shutdown of the line starting in 2019. This option, though understandably unpopular with commuters, results in faster and less costly repairs. David Jones, a de Blasio appointee on the MTA board and long-time transit advocate, echoed Kabak. “I was convinced by the arguments they made that to do this in a piecemeal fashion would have led to chronic delays and lasted a much longer period of time,” he said of the planned L Train shutdown. “I don’t think this is going to be pleasant,” he added, though conceding that it is the best approach to a less-than-ideal situation. A prime factor that causes a majority of subway delays is overcrowding. In a sense, the MTA is a victim of its own success and, since the 1990’s, has seen ridership rise from four to six million daily riders. Unfortunately, in that time, the system has added less than 30 new train cars, leading to trains running at peak capacity. As a result, overcrowding is now responsible for more than one-third of the 75,000 subway delays each month, according to MTA data. An effort to add more miles of track would also improve service. This is evident from the launch of the Second Avenue subway line, which, in its first month, reduced ridership on the busy Lexington Avenue line by 27 percent between 42nd and 110th streets. But Smith is not optimistic that Governor Cuomo will launch large subway expansion projects to reach underserved neighborhoods. “Andrew Cuomo is very focused on the 2020 election, which is why he’s focused on rebuilding bridges,” he said. He doesn’t expect Cuomo to show a similar commitment to mass transit. “I don’t have much hope,” he said. 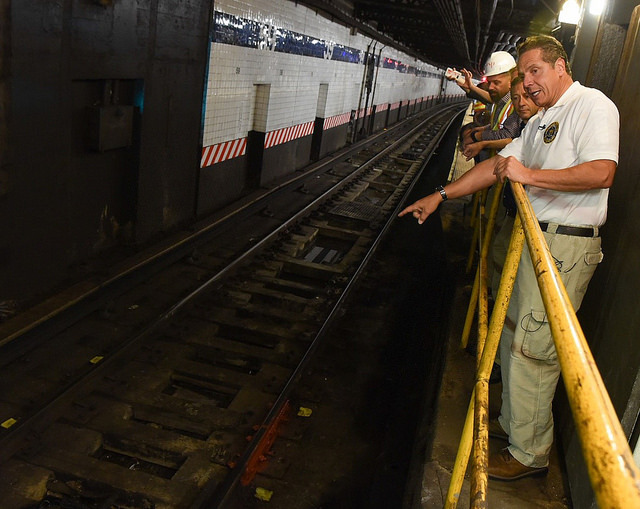 It’s widely acknowledged that the MTA has lacked for investment for years, and elected officials and advocates have proposed numerous options to fund repairs. Fare hikes have been used in the past but are unpopular, for obvious reasons. The Empire Center’s E.J McMahon suggested in June the State should use 40 percent of the over $10 billion from banking fines and penalty money in the last three years to finance subway improvements. Recently, State Assembly Member Robert Carroll proposed increasing the city’s 50-cent taxi surcharge to one dollar, and expanding this tax towards black cars and ride-hailing services. A coalition of eight transit advocacy groups have also proposed taxing the property value added through real estate upzonings to finance investment in transportation. But experts told Gotham Gazette that it’s not a lack of funds, but rather the manner in which they are put to use which is the more significant. Costs for long-term transit projects in the city tend to balloon over time, owing to delays in construction and increasing labor costs. Transportation writer Alon Levy estimated that New York City’s cost per mile of subway construction astronomically outpaces what other major cities such as Madrid, London and Paris spend. The first phase of the Second Avenue Subway first phase, for example, cost $4.5 billion -- $1.7 billion per kilometer, or just under two-thirds of a mile. In comparison, London’s Jubilee Line Extension, Amsterdam’s North-South Line and and Berlin’s U55 cost $450 million, $410 million and $250 million per kilometer respectively. The cost of the Second Avenue Subway, about four times as much as the equivalent in Paris, was not an aberration. The 7 line extension has cost near as much per kilometer of construction and the East Side Access is even projected to surpass the cost of the Second Avenue line. Smith and Levy agree that until officials figure out how to get more bang for their buck for both tune-ups and new construction, the city’s transit troubles will likely continue. For them, the discourse on the issue features an outsized emphasis on raising revenue while ignoring the soaring costs. “It’s difficult to ask people for more money when they’re not getting much for it,” Smith said. Nicole Gelinas, senior fellow at the Manhattan Institute, a conservative think tank, echoed that argument. “The problem is we’ve implemented a new tax for the capital plans but we’ve never dealt with the cost side,” she said, attributing the bulk of costs to labor. “Labor is 40 percent of the costs, 40 percent materials and then 20 percent overhead and white collar,” she said, referring to a report released in April by the Empire Center for Public Policy. Those labor costs are “25 percent higher than they should be,” she said. Smith concurred, suggesting that high labor costs and a “mind-boggling amount of waste” are the likely culprits. MTA’s Lieber conceded as much on the Gotham Gazette-CBC podcast, pointing out that the agency has not been sufficiently scrupulous in its procurement and project coordination, leading to costly labor. Lieber, who previously worked for Silverstein Properties as president of World Trade Center Properties, believes the MTA can take lessons from the private sector to lower costs. “You have to have design process that is going to resolve all the design questions and then not reopen them,” he said, contending that continuous arguing and haggling over design often delays and increases project costs. To do this, the parties involved need “close collaboration on design, so you don’t have change,” he said, insisting that the agency needs to ensure efficient and timely construction work. Lieber also noted that builders often squander money on excessive last-minute repairs to completed projects, which adds to the final price tag. In his new role, Lieber said he’d enact measures to tackle these inefficiencies and improve how the MTA conducts its business. In the absence of state action, experts agree that there are initiatives de Blasio can take on his own. Earlier this month, a coalition of transit advocates rallied around seven transit initiatives they want City Hall, and any candidate running for elected office in the city, to adopt. These include discounted MetroCards for low-income New Yorkers, alternatives for when the L Train shuts down, and enhancing bike and bus lanes. For his part, the mayor has touted the expansion of the express Select Bus Service and the New York City Ferries as examples of incremental improvements his administration has made. And, more ambitiously, his administration is exploring the Brooklyn-Queens Connector (BQX) proposal, a streetcar that would run along the waterfront from Sunset Park in Brooklyn to Astoria, Queens. Similar to the procedure with which former Mayor Michael Bloomberg expanded the 7 train to the West Side, the de Blasio administration hopes to finance the project with value capture funding, which collects the value of increased property taxes in the neighborhoods along the route. Kabak concurred. “Their plan is suspect from a transit routing perspective and the plan is suspect from a financial perspective.” He argued that real estate interests were the driving motivator behind the misbegotten idea. Kabak suggested what he believes to be better alternatives to the BQX route, that the mayor can work on without state cooperation. He pointed to the Triboro RX proposal, a proposed route that would run from Bay Ridge, Brooklyn through Queens to Co-op City in the Bronx. 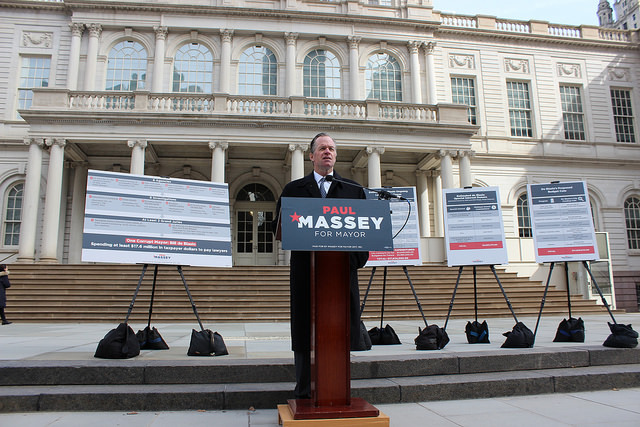 It would serve an “unmet demand” for trains in areas such as Flatbush and Flushing, he said. Coinciding with mass-transit troubles, and partly because of them, New Yorkers have also experienced an uptick in traffic congestion, and continued subway dysfunction is likely to make matters worse. Gelinas said this is an area where de Blasio can take small steps such as making the streets safer for bicycles and improving street management. “When you look at the streets, the streets are just complete chaos, so you can understand why people don’t want to ride bikes,” she said. Along these lines, the City Council has discussed pushing the NYPD to increase bus lane enforcement and crack down on placard abuse, as well as adding bus and bike lanes. A more ambitious measure requires encouraging ridership from the outer parts of Queens via the Long Island Rail Road. In fact, as transit experts are quick to note, one of the few advantages of gubernatorial control of all New York public transportation agencies is the ability to integrate different modes of transportation. Levy argued that the LIRR, though passing through decidedly urban parts of Queens, better serves suburban commuters. He recommended that the LIRR be integrated, like the subways and buses. This would reduce E train ridership and take drivers off the road, he argued. He also proposed matching subway schedules with the LIRR to allow for quicker commutes from Queens. Jones, the MTA board member, voiced support for gas taxes and congestion pricing to discourage driving. These measures would, however, need the backing of the governor and the state legislature. Governor Cuomo has said congestion pricing is a “nice idea” but insists that the legislature, which has rejected it in the past, still lacks the appetite for it. Mayor de Blasio similarly has insisted that congestion pricing is contingent on state action, and has shown little interest in pushing the issue.